This was our first ever attempt at making risotto and it turned out great. We didn’t follow any formal recipe but were inspired by the presence of fiddleheads at the local grocer. 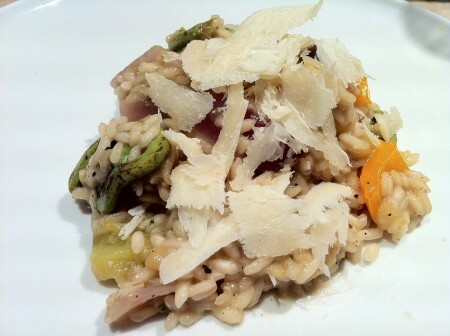 Our recent trip to Lawrence also got us in the mood to try out fiddleheads in a vegetarian dish. Although we were at first tempted to use the California brown rice we already had, we went out and bought some Arborio rice to get that starchy creamy consistency. We began by sauteing the vegetables in a large saucepan and eventually added 2 cups of rice. From then all it took was constantly stirring and adding half a cup of vegetable broth at a time until 6 cups had been absorbed. Shaved Parmesan to top it off and some apple crisp and vanilla ice cream for desert. Exhausted after sunning ourselves all day and swimming in the lake (I know, hard life right), we had to have something that was going to fill our empty stomachs and wake us back up. While enjoying the beautiful view of our backyard, we started with a tomato and watermelon salad with feta, dill and mint. The first time this dish was made was for my parents – for their joint birthdays back in April. 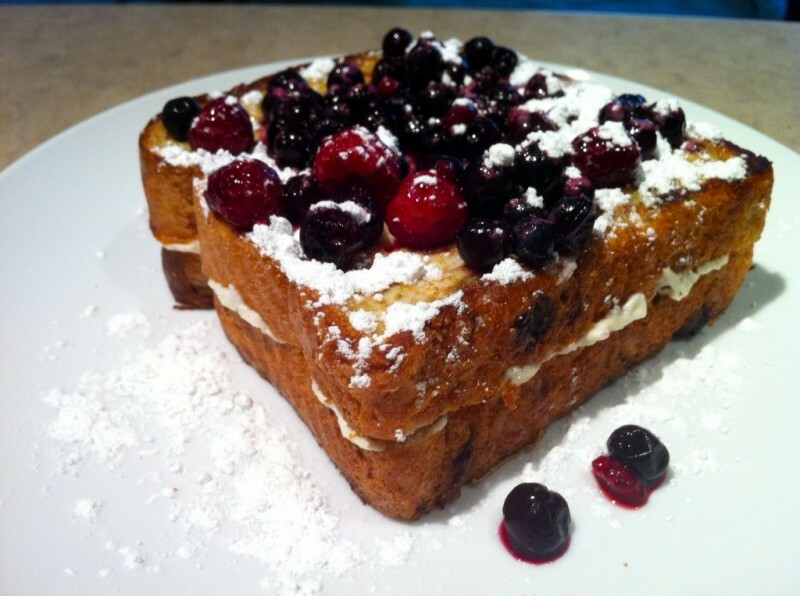 Since then, it has become a house favorite for the summer, despite the seemingly uncommonly put together ingredients. The watermelon brings sweetness to the dish, the tomatoes weight, the walnuts a crunchy texture and the mint and dill a surprising twist. The recipe can be found here. For the grilled vegetables, all you need is fresh produce. 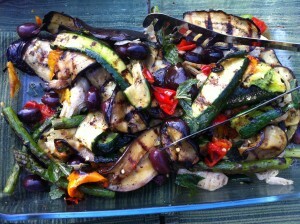 Cut up a few eggplants, asparagus, red peppers, artichoke and whatever else you fancy and throw them on the grill. Easy! The challah bread is store bought, so just head to your closest Kosher bakery and pick up a loaf. The ribs are perfect for a summer BBQ. Juicy, tender and oh-so-delicious. The ribs have to be pre-cooked for three hours until the meat is falling off the bone. It must then be marinated with Diana Sauce and grilled for five to seven minutes. Check out this link to get the details on how to make the rhubarb strawberry oat crumble. This is also a relatively easy recipe to get through. Throw all the ingredients together in a baking dish and put it in the oven. Good to go! Dhal Puri is a traditional Indian flat bread which has made its way across oceans and onto the streets of countries around the world. It is particularly popular as a street food in Mauritius, a small island in the Indian ocean. In fact, Mauritian Dhal Puri has it’s own Facebook page. We ate this batch with the option of salmon curry or a light and spicy tomato chutney. 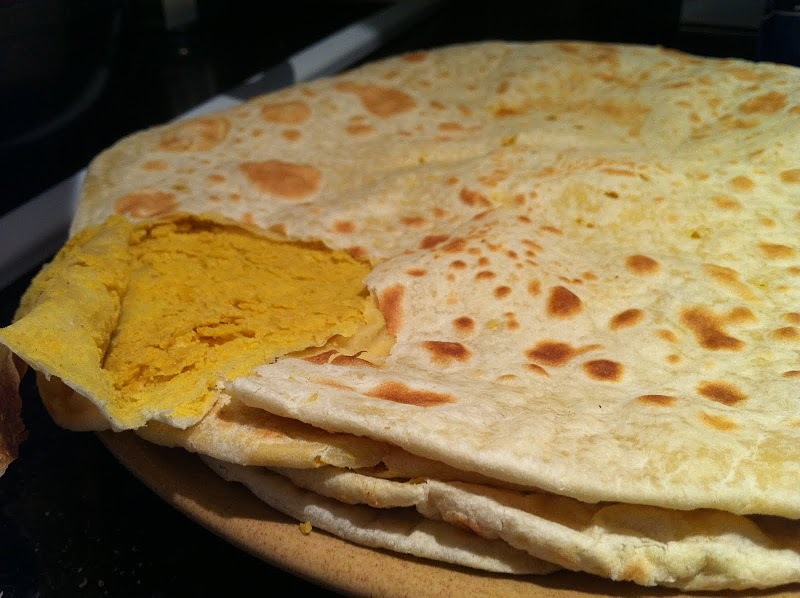 The bread is filled with a mixture of saffron and split peas – here is a recipe for reference. Last night, we ate according to the weather. Cool and grey, the humid spring temperature brought the black flies and the mosquitos out of hiding and out into the open, forcing us to abandon any hope of staying outdoors. Scampering inside to avoid the pestering swarm, we contented ourselves with making a delicious home-cooked country meal. The leek and potato soup required we ‘sweat’ the vegetables (carrots, celery, leeks and onions) in order to extract the flavor for the soup base. Thickening it with cream and potatoes, we finished the dish with salt and pepper and served it with a dash of cayenne pepper for a hint of spicy flavor. 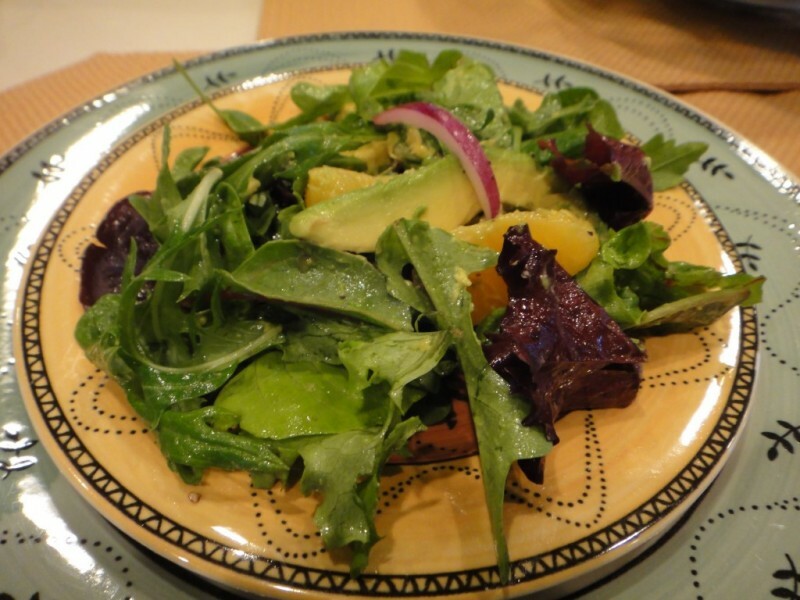 For the salad, we used a spring mix with arugula and added orange slices, sliced avocado, chopped red onions and dried cranberries. The dressing was half a lemon’s worth of juice, olive oil, salt and pepper. Simple yet tasty! The main meal had us sautéing the onions, carrots with added spices of cardamom, cumin, smoked paprika and cayenne pepper. The chicken slices were done in a similar way with raisins, plums and oranges, later baked in the oven for 60 minutes. The Israeli couscous was boiled and mixed in with the chicken and vegetables. All in all, a great meal! 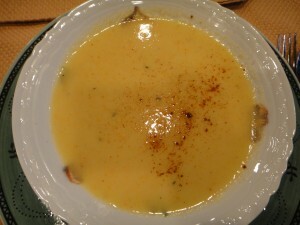 For the next time, I would serve smaller portions of the soup and the main as they are both heavier dishes. 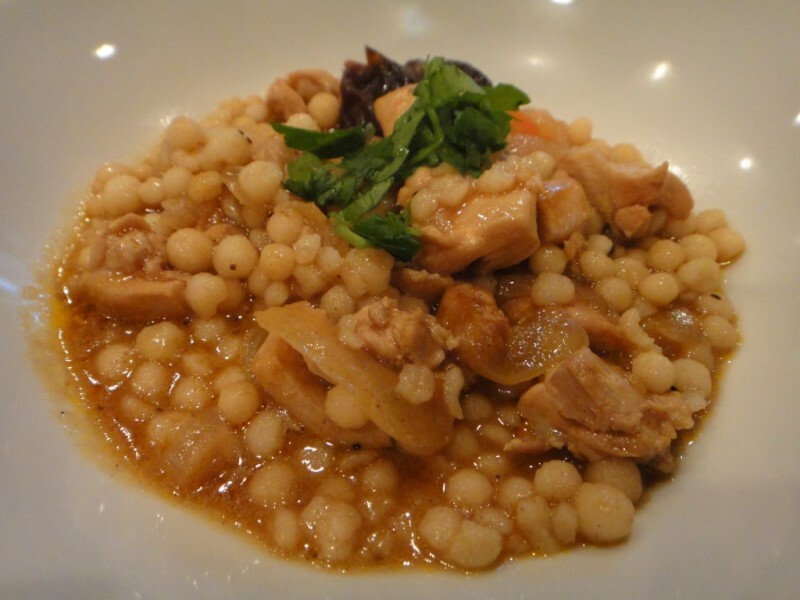 The Israeli couscous must be boiled for at least fifteen minutes (don’t treat it like regular couscous – that takes around ten minutes) otherwise the grain comes out a little tougher than most people like. I first encountered a version of this recipe at Trident which is an independent cafe & bookstore in Boston. Trident was named Best Neighborhood Restaurant, Back Bay by Boston Magazine and for good reason. Their version used thick sliced Challah bread which was stuffed with lemon ricotta filling while our creation on the left had the same filling sandwiched between two slices of cinnamon raisin bread. This is closer to a recipe posted on Always With Butter but we added wild berries. We used more then the recommended teaspoon of lemon zest in an effort to get a bold taste and came close to overdoing it. Overall it was great with or without maple syrup and was pretty easy to make.